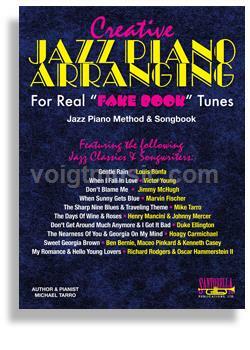 Creative Jazz Piano Arranging for Real “Fake Book” Tunes is a method and songbook written by Michael Tarro. This new title for Jazz Piano is a culmination of more than thirty years of experience in teaching piano. It contains musical concepts and explains many techniques for any jazz pianist to develop their own interpretive style. This instructional collection teaches how to create variations of simple melodies of many well-known standards as written in every Fake-Book which includes: • A phenomenal collection of the most popular jazz standards ever written. • Complete original jazz piano arrangements clearly notated with precision. • Improvised solos transcribed in their entirety with strict adherence to detail. • Incredibly valuable jazz piano techniques for developing interpretive skills. • A recording of every arrangement performed by the author, Michael Tarro • A bonus track of Tarro's award winning “Big Band” single, Traveling Theme. Creative Jazz Piano Arranging provides a logical approach towards creating arrangements of simple well-known melodies. This powerful tool in developing performance excellence is one of the first steps toward becoming an incredible jazz pianist. Gentle Rain by Louis Bonfa * Don't Blame Me by Jimmy McHugh * Sharp Nine Blues & Traveling Theme by Mike Tarro My Romance and Hello Young Lovers by Richard Rodgers and Hammerstein * When Sunny Gets Blue by Marvin Fischer Days Of Wine & Roses by Mancini & Johnny Mercer * Nearness Of You & Georgia On My Mind by Hoagy Carmichael Sweet Georgia Brown written by Ben Bernie, Maceo Pinkard and Kenneth Casey * When I Fall In Love by Victor Young and Don't Get Around Much Anymore and I Got It Bad and That Ain't Good by Sir Duke Ellington.